Who doesn’t love french fries? I try my best to avoid making them, but I feel the need to having some nice fries from time to time. 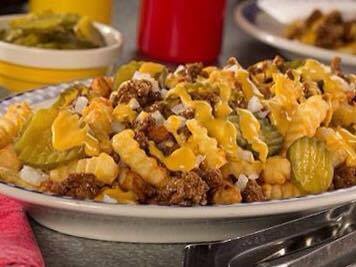 Such as this cheeseburger fries recipe that will blow your minds! Check it out. 1 (32 ounce) bag of frozen french fries. ¼ cup of yellow mustard. ½ cup of sliced dill pickles. ¾ cup of warmed cheese sauce. Bake the french fries in a baking sheet according to package instructions. Cook the ground beef in a large skillet over high heat for 6 to 8 minutes until browned then remove the fat. Mix in the ketchup, mustard, salt and pepper and stir for 2 to 3 more minutes. On a large platter, arrange the french fries and pour the mixture over them. Sprinkle onion and pickles over the top and top with cheese sauce. Easy, peasy and cheesy! This is not just fries, it’s a meal! Whenever I make this, I eat it alone over lunch! Give it a shot, you will adore it.